It's been less than two weeks but it's felt like forever since I got that first BFP. Today is finally Doctors day! So I waited my turn and gleefully trotted into my Doctors room when she called for me. As I took off my coat she asked "So.... how did the pregnancy test go?" I grinned and reached into my bag "Would you like to see? Don't worry, they're in a bag!" 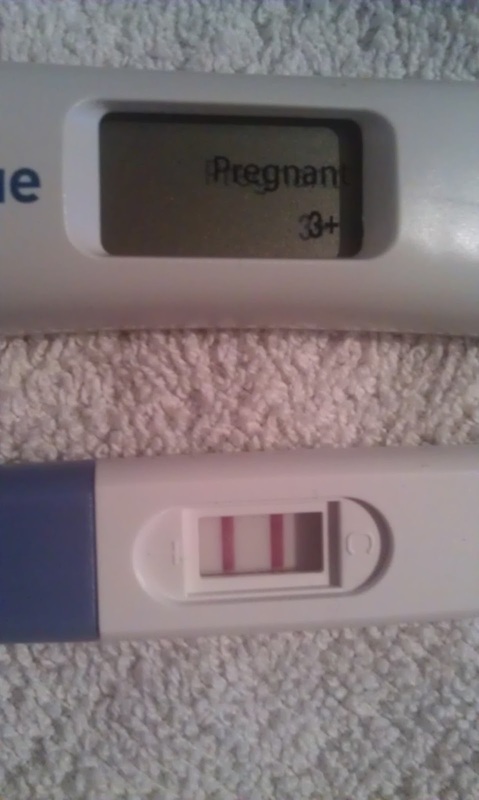 She laughed and had a look at the two tests I did this morning, one a regular pregnancy test, the other a clear blue digital. She decided against any further tests! "Well, I think you're pregnant!" We chatted for a little about my change in diet and my weight loss. When I explained what I was eating she was perfectly happy for me to carry on with the changes I have made. She said that loss in the 1st trimester is fine, and I should focus on not gaining any weight in my 2nd and 3rd trimesters. She said that "babies are perfect parasites" that take everything they need from their mums to grow and be healthy. My current dietary choices cover that and if I carry on as I am (losing a little in 1st tri and maintaining in the 2nd & 3rd) we'll both be healthier for it. And yes there is the added bonus that I would be slimmer after my baby is born which is nice too. So that's me safely guilt free for losing weight! (And armed against the haters who would gladly send me abuse about harming my baby by "dieting".) I am still eating loads of food: 3 proper meals a day plus fruit & veg snacks all through the day, and I feel fab! Apart from being tired by 5pm... but that's just being pregnant with 3 kids under 6 at home already! She asked me to book in with the midwife for when I felt I was 8 weeks pregnant. I believe my little Bean is 3 weeks and 1 day old, which would make me 5+1 weeks (5 weeks + 1 day) pregnant. Only until my dating scan my pregnancy will be judged on my last period which make me 6+4 weeks. 8 weeks would be smack bang in the middle of the holidays - and wrong anyway. So I asked for an appointment in around 3 weeks time. I got Mon 13th Jan which will be 8+5! That will do very nicely! Since that will put me around 10 and a half weeks by their reckoning I might not have to wait too long from my "booking in" to get my first scan!